Unlike traditional hot cup lids, the Renewable EcoLids are made with PLA, a plant-based material, instead of traditional oil-based plastics. Traditional plastics are made from petroleum, the world's most valuable, nonrenewable resource. Polylactic acid (PLA) or ""corn plastic"" is made from annually renewable resources, not oil. Crystalized formulation adds strength and heat-tolerance. 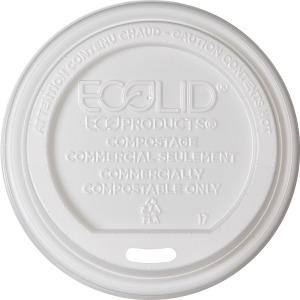 The EcoLid is specially designed to top off hot beverages and prevent leaking. 100 percent renewable lid offers a heat-tolerance of 200 degrees Fahrenheit and fits 10 to 20 oz. cups.